My brother recently got married and during Boxing Day, I watched how the happy couple enthusiastically paged through all the books they'd received as gifts. To them the books were as expensive as the next toaster or dinner set. My own immediate thought was “Wow! Wouldn't it be wonderful to receive Satyajit Rai's complete Feluda series as a wedding present?” But the art of gifting people with cherished tomes seems to be disappearing amidst a visual culture of television, DVDs and the Internet. Where to put the blame for this trend? There are simply so many factors to the equation. I grew up around books. We had cable TV as well, with shows my brother and I were addicted to like any average kid. But our parents took the time to instill in both of us a deep appreciation for reading. They loved filling up the shelves with their favourite authors and introduced us to the magical, transforming power of books their ability to transport us beyond our puny lives and to shape the very texture of our personalities. But the equation didn't end there. They also took us on frequent trips to the library based inside the Army cantonment. In the equation of fostering a reading culture, a library acts as a compounding device, allowing a child to multiply the efforts of parents and the school, and providing the materials to make this process possible. Today, with books and movies more expensive than ever, and television entertainment free-falling to the lowest levels of stupidity, the library provides a place and an incentive for children to progress in reading. Public libraries are also places where ordinary citizens with limited funds and knowledge can gain both access and equity. These days they also serve a vital social role as Internet access points for people who are otherwise unconnected to the information superhighway. I feel envious when friends and relatives abroad talk to me of neighbourhood libraries that function like a gathering place; where communities find themselves. The book discussions, readings and classes, the homework help after school, the nods and hellos people exchange when they see each other at the library for the second or fifth or twentieth time, the librarians greeting people by name, and even the artwork that reflects the talents and interests of the neighbourhood, all contribute to the connections that bind people in a community. People may go to the library looking mainly for information, but they find each other there. As a PhD student in Wyoming, he feels “People, I find, even in my generation, don't have the understanding that two plus two makes more than four if knowledge is shared among friends, colleagues and acquaintances. “From my experience, it always leads to a win-win situation. Public/private libraries play a big role in developing this kind of 'intelligentsia' which can shape and guide the nation to move forward positively in the future. Also, look at the quality of writers we, Bangladeshis, possess. “Can anybody tell me why we no longer have writers like Late Shahidullah Kaiser, Late Munir Chowdhury, Late Syed Waliullah or Late Kazi Nazrul Islam? Forget about Maya Angelou, Milan Kundera, Gabriel García Márquez, Dominique Lapierre, or Naom Chomsky. If you look around, we don't even have quality authors like Shomoresh Majumder, Sunil Ganguli or Satyajit Rai, who are from our neighbouring Indian state of West Bengal,” he says. “They played, and are still playing, considerable roles in shaping the minds of the youth, who later become conscious citizens, a crucial factor for a society to progress with the middle class or bourgeois community taking the lead. There is a high probability that a strong middle class can provide us with capable leaders, which a developing country direly needs. “Writers like Humayan Ahmed, sorry to say, won't be able to play a role like this. I believe libraries inspire you to dream and to write, but the quality of our local libraries today can hardly provide such inspiration,” he voices his strong opinion. The presence of libraries in Dhaka (forget the rest of the country) is- needless to say- deplorable. 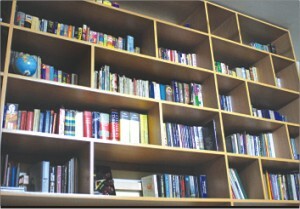 At present we have only six major libraries in the city. There is the British Council Library with audio-visual and internet facilities, the USIS library which has an article-alert service including newspaper microfilms, the Indian Information Service Library and the Bishwa Shahitya Kendra Library, with its unique mobile library service. But the conditions of the two Public libraries of the city the Armanitola branch, previously known as the Northbrook Hall Library or the Lalkuthi Library, and the Mahanagar Pathagar at the south-eastern corner of Osmani Uddyan makes me want to cry. The collection hasn't been updated since time immemorial I'm sure, and whatever there is, is falling to ruins. Top officials from the government and business sectors should realise the immense importance of having quality libraries and do their part in helping to reverse the current situation. I came across news of how developers of the Glendale Mall in Indianapolis, USA approached the Indianapolis Marion County Public Library officials with a lease proposal offering over 33,000 sft space for a branch library that would serve as an anchor store in the mall. The library has been very successful, helping to revitalise the mall. The day I see one of the countless urban community development projects like Bashundhara City, Jamuna Future Park or Japan Garden City have included a library in their plans, I will kneel over. Not from shock but with the joy of having more opportunities to page through shelves of books stacked into neat rows. Books that whisper of far away kingdoms with fantastic, ethereal creatures; of nerve-wracking mysteries and wild, reckless adventures led by handsome heroes and beautiful heroines; of tales of human triumph and failure; of wisdom, love, hope, fear, despair and every other human emotion there is out there. Books that whisper life.